As the holidays near and I spring around with glee because I love–LOVE–Christmas, the question of gift giving and receiving is in the air. Presents are often a divisive topic amongst the frugal cadre as we, by our inherent frugal weirdo nature, can’t abide seeing money wasted on worthless stuff. However, as people who are equal parts frugal and Christmas adorers, Mr. Frugalwoods and I have staked out a middle ground with holiday gifts. We don’t spend a ton, but we’re not grinches either. The primary way that we save money and stress is by not giving gifts to each other. This is an approach we agreed upon several years ago and its been the best holiday-related decision I think we’ve ever made. Instead of racing around trying to divine what we should buy for each other, we spend that time together, engaged in festive holiday pursuits that bring us closer. And instead of throwing away money on things we don’t need, we save that cash for our longterm goals… or just for special ingredients for yummy holiday dishes. Not giving presents to each other is more about avoiding consumerism–and focusing on things that actually strengthen our relationship–than it is about the actual dollar amount saved. 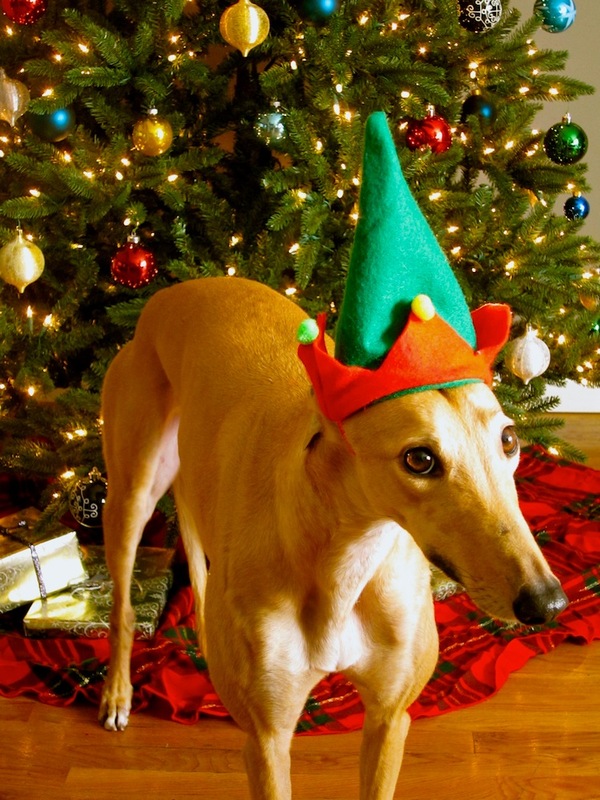 We do, however, enjoy giving gifts to our immediate family members–all told between both sides, there are 13 humans and 5 dogs (not counting me, Mr. FW, Babywoods, and Frugal Hound). We also like to make delectable homemade treats for our neighbors, friends, and co-workers, which is an ideal way to both practice the fine art of baking and celebrate on the cheap. Baking Christmas shortbread cookies to share! Likewise, our families enjoy giving gifts to us and every year, they request our Christmas wish list. And every year, we used to hem and haw and cast about in darkness for what we might possibly want. Frugal weirdos don’t lust after endless material goods and it’s honestly often quite tough for us to figure out what to ask for because we live our lives luxuriously and have basically everything we need. So, we devised a system whereby we maintain an Amazon wishlist throughout the year and every time we think of something we need, we simply add it to the list. This list then works as both a wishlist and a delayed shopping list–if months elapse and we’re still in desperate need of something (the latest example was a pair of shoes for Mr. FW as his old shoes actually wore all the way through in one spot… ), we’ll buy it. Otherwise, the items are there for our families to peruse. And the best part? We’ve convinced our families (for the most part) to practice wishlisting as well. This is ideal in my frugal book, because now I know we’re buying things that our nearest and dearest will actually use. Over the years, we’ve become increasingly practical in our gift giving and receiving, and I’ve noticed that our kin have as well. I absolutely adore the practicality reflected in this list and I love that our families are so down-to-earth in the things they request. I’m delighted to buy soap for my dad because I know he’ll use it! Far better than getting him some sort of bizarre tie clip that he’ll never wear. P.S. I’m sorry if Amazon is a hegemon poised to take over the commerce world, but it’s darn convenient to shop with them. Another wonderful gift option we employ are charitable contributions made in family members’ names. Mr. FW and I do all of our charitable giving at the end of each calendar year and so its a natural extension to make contributions to organizations that are meaningful to our family members in their honor. Both sets of our parents make charitable gifts in our names as well, which I think is a wonderful family tradition. Teaching children about philanthropy is a central tenet of raising good citizens, and a key component of financial education, so I’m grateful to my folks for instilling this lesson early on. We plan to educate Babywoods about how very fortunate she is and how we feel it’s our duty to give back. In a word, I’d say we do this unconventionally. Again, I must invoke Amazon’s name–I’m sorry, but they make this process so dang easy for us! We have the Amazon cash back rewards Visa card, which nets us points to redeem on Amazon. We don’t purchase a whole lot over the course of a year, but it’s enough to rack up a tidy sum of Amazon points. Then, we typically use these points to obtain gifts for our families. Another tactic in our frugal present procurement strategy is the use of gift cards. I save every gift card we receive and, more often than not, translate it into a gift for someone else. There just isn’t all that much that Mr. FW and I need and so I’m happy to use gift cards in service of future gifts. We also re-gift. I know this is controversial, but I personally think it’s fine if it’s done thoughtfully. I store all gifts that we won’t be using in a box with a note of who gave them to us (there’s nothing more gauche than re-gifting back to the original recipient… ) and then, if a gift seems appropriate for another person, I re-gift. Simple as that and I’m not embarrassed to admit it. Better that things get used than sit around collecting dust in our basement. And finally, we give used gifts. My family and I have an understanding, and a belief, that used items are just as good as new. And so, we think nothing of gifting one another thrift store or garage sale finds as gifts. It’s important to be on the same page as your recipient about the merits of used finds, but I for one am incredibly thankful that my family is on board the used train. Saves us all a ton of money and, helps keep things from the landfill! Each year, our Amazon wishlist is stocked with items that primarily fall into the categories of: household goods, kitchen implements, or tools. 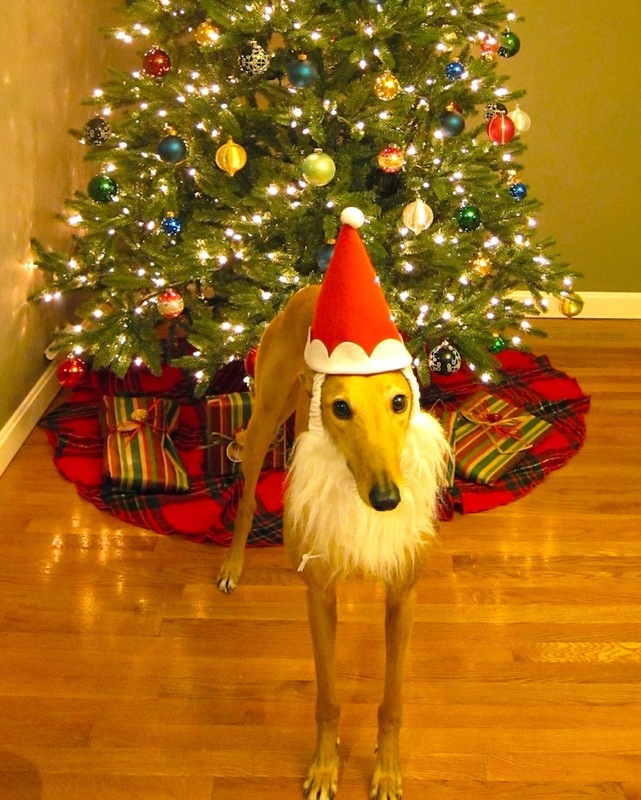 Occasionally, there’ll be a specific clothing item–such as a pair of shoes–or a toy for Frugal Hound. If you’re a frugal weirdo, or if you’re hoping to purchase a present for a frugal weirdo, the below are some excellent choices. The key in gift giving to a member of the frugal species is to remember that we abhor waste and cringe when money is wasted on things we don’t need (never mind that it’s someone else’s money–it pains us all the same). The very best strategy is to obtain a list from your frugal weirdo of what they’d appreciate, but short of that, these items are likely to be met with praise. These babies are a secret weapon in our successful battle against food waste and eating out. Since we (well, technically Mr. FW) cook all of our meals at home, having adequate storage for said meals is crucial. We have two sets of containers, with sizes ranging from teeny (perfect for carrying my daily hard boiled egg to work) to gigantic (for storing massive quantities of soup or sauce). In a given week, we typically employ almost every single container. While plastic containers are less expensive, they’re also less useful. They have the potential to leech chemicals into food and, they stain. Just try putting red sauce in a plastic container—not pretty. Another advantage of glass is that it’s heat resistant and handles both dishwasher and microwave with aplomb. Clearly we think about food a lot. Prior to the miraculous arrival of Corelle in our lives, we used janky plastic plates and bowls, bought for cheap while we were in college. Upgrading our dishes was a big decision and we knew we wanted a product that would stand the test of time. Since we have to touch, view, and otherwise eat off these things on a daily basis, I desired certain aesthetic features as well. Corelle ticks all of these boxes. They’re a sleek, modern bright white, which pairs perfectly with any dinner party theme or holiday decor (I’ll admit it–I love to color coordinate!). Plus, they don’t stain, chip, crack, or otherwise show any wear. Unlike their porcelain counterparts, Corelle is a magic formula that’s nearly indestructible. Scratch marks from flatwear are non-existent and gunk washes clean off. While it’s true that Corelle doesn’t chip or crack, it can break. And when it does breaks, it’s epic. I accidentally dropped a bowl on our quartz countertop a few months back and the result was alarming. Shards skittered across the countertop and I swear that bowl broke into at least 50 different pieces. But in all the years we’ve owned our Corelle set, this was our first break. Short of dropping it directly onto a super hard surface, these plates don’t shatter. We love this thing so much that we’ve both given and received it. The Frugalwoods electric kettle is a revered member of our family due to the fact that it produces our daily coffee and oatmeal allotment. 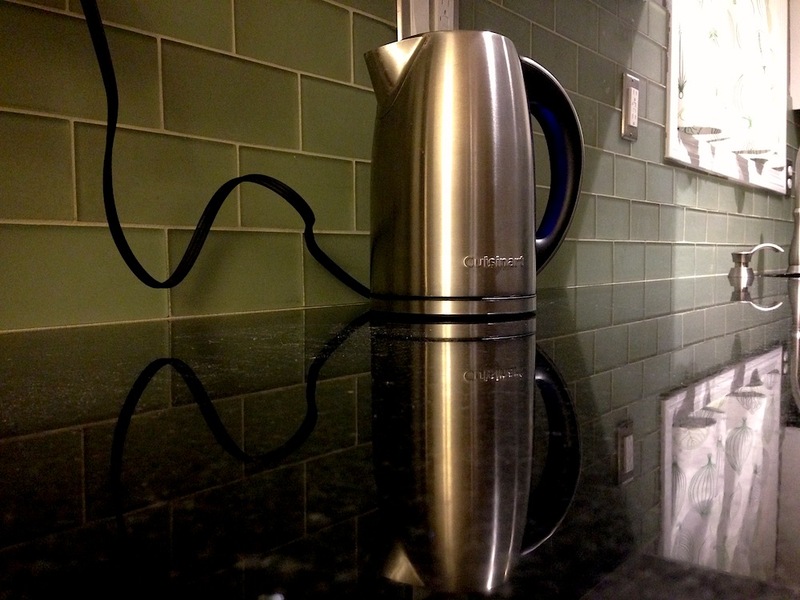 For us, the electric kettle replaces a coffee pot, microwave, and traditional tea kettle. While we still employ our microwave on occasion, it dwells in the basement due to its infrequent usage. Further, we save energy with the kettle since we only heat the precise amount of water we need. And, that water is heated to the exact correct temperature, which is key for our coffee preparations. Although not inexpensive, our daily usage of this kettle makes it entirely worthwhile. Plus, since it’s one of the few implements that sits out in the open in our home, I appreciate its lovely stainless steel design. I felt I needed the modifier “kitchen,” lest you think we’re asking for ninja stars. A decent knife is a crucial aspect of good home cooking. The knife is often the genesis of a meal and thus, having one that works well is relatively paramount. While good knives aren’t cheap, they’re not necessarily expensive either. When knife shopping, it’s important to locate a knife with a full tang (meaning the metal goal all the way through handle) as the knife will be strong and well-balanced in your hands. Another helpful attribute is a knife of good quality steel that can be sharpened again and again. Sharpening one’s knives is a worthwhile task because a sharp knife is a safe knife—dull knives will slip off food and cut you (they have no remorse). Mr. FW sharpens his knives every few weeks for maintenance and once every few months for a serious edge (point in fact, he received this knife sharpener as a gift one year). Mr. FW finds that he does need a few different knives, but not a full knife set, which is ideal since with a set, you’ll likely end up paying too much for too many different knives that you don’t need. 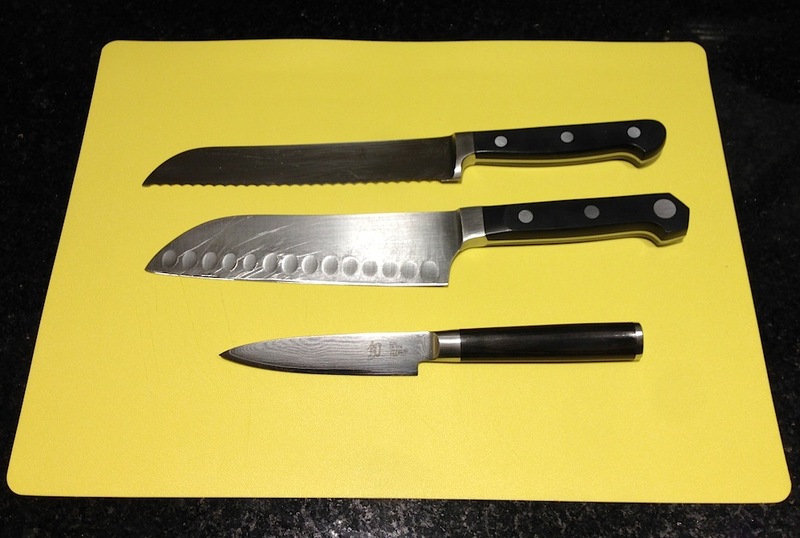 Mr. FW’s knife collection includes: a chef’s knife, a bread knife, a paring knife, and a boning knife. This is a sufficient array to enable him to achieve all his culinary aspirations. If you only request just one or two knives, go with the chef’s and the bread knife. Mr. FW whipping up homemade hummus. Cheaper & tastier than the pre-packaged stuff. 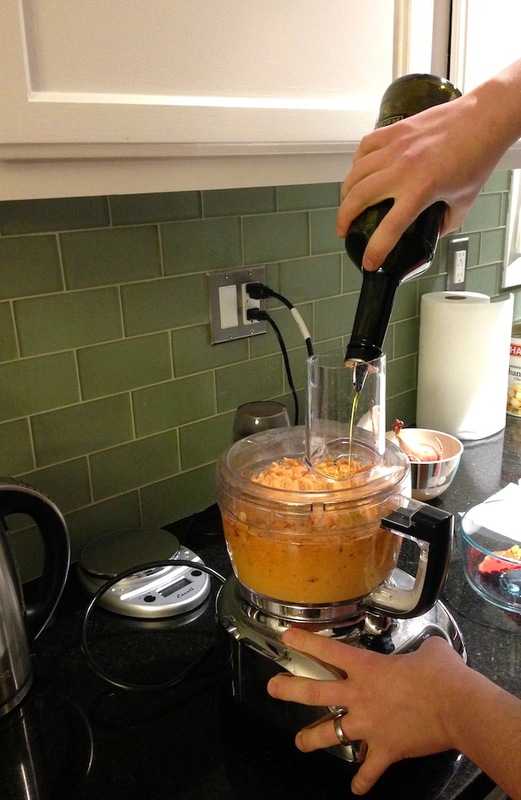 Our food processor is one of those tools where it’s often the only thing that’ll suffice. For example, you simply cannot make good, smooth hummus without a food processor. And, let’s be honest, no one wants lumpy hummus. We have a very simple yet powerful model, with just 3 buttons: on, off, and pulse. This accomplishes the job perfectly and any additional buttons are just fancy extras that can break. 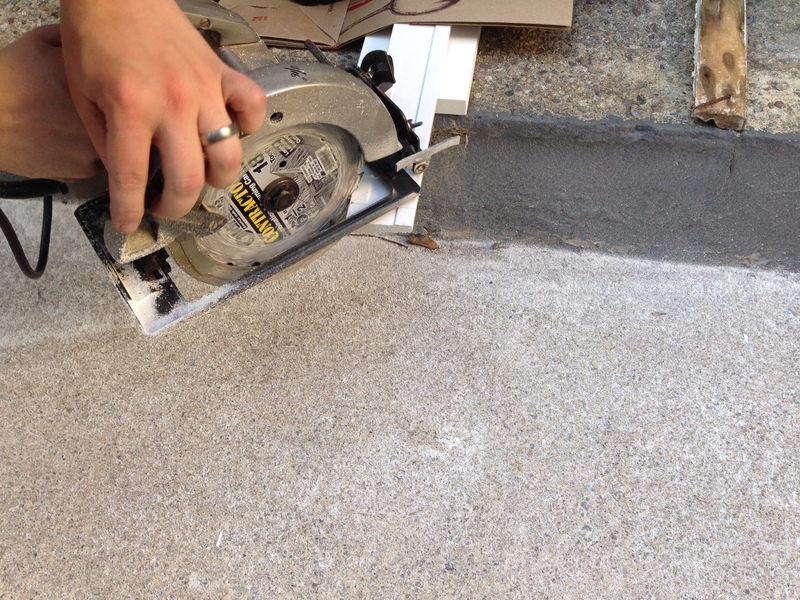 As Mr. FW works on home improvement projects and realizes he’s using the wrong tools, he comments to himself “man, I wish I had X tool in order to do this project” and then he’ll add it to the wishlist. In this way, he’s been slowly building his retinue of tools over the years. Having the right tool for the job makes all the difference. A few tools he’s found invaluable after receiving them: this reciprocating saw and this high-speed rotary tool. The Roku supersedes our need for cable, Netflix, HBO GO, and whatever else people pay for to watch TV these days. This was a wonderful gift since it allows us to prevent a recurring expense (which is what cable is for many folks). More about how we watch TV for free here. Tools! Always welcome by frugal weirdos. You likely noticed that the majority of this list relates to the kitchen. That’s because frugal weirdos typically cook all of their meals at home and thus, are in need of robust kitchen gadgetry. Additionally, nice kitchen implements are more difficult to find on the used market than say furniture, clothes, or home decor. I do occasionally see kitchen supplies come available through the Buy Nothing group, at garage sales, or on Craiglist, but they’re often rather beat up and quite past their prime. Same story for tools–since we like to do all of our own home improvement and repairs, tools are an indispensable part of our household. And, legitimately good tools are rare as greyhound wings on the used market. Most importantly, all of these items enable greater frugality as they allow us to prepare our own food, fix our own house, and create our own entertainment. Frugal wins all around! While I got pretty specific here about things you could buy–which isn’t my typical modus operandi–I think it’s a prime example of how Mr. FW and I strike a balance between our $0 spending approach and our participation in the holidays. We don’t go wild with our spending “just because it’s Christmas,” nor do we harrumph around and refuse to take part in our family traditions of gift giving. 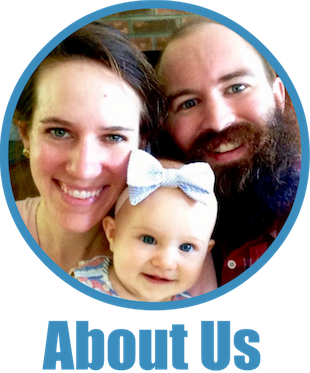 For us, living extreme frugality is all about finding tenable, comfortable balances between spending and saving. We’re not out to horde every last penny we make–rather, we’re out to create a meaningful, fulfilling life that’s not centered on buying things or acquiring stuff, but on creating happiness in our daily interactions. Everyone’s comfort level with holiday spending is different and I encourage you to think carefully about whether you’re spending in ways that bring joy to you and your loved ones, or if you feel pressured to spend money you don’t have. I think it’s crucial to be transparent with family members about where you are with your financial goals, and maybe in some years (especially if you’re in debt), gift giving should be scaled back. The holidays aren’t about giving stuff to each other–they’re about spending quality time together celebrating the true meaning of the season. I wish you all a season of peace and love–neither of which are sold in stores by the way (not even on Amazon!). How do you handle holiday gift giving while maintaining your financial goals? That is the exact electric kettle I just requested for Christmas! I am glad to hear you talk about charitable giving. That is something I had wondered about in your other budgeting posts. I also love giving and receiving practical gifts that people actually use, and my Christmas shopping is done mainly on Amazon & thrift stores. We maintain Amazon wishlists featuring frugal weirdo things like glass food storage containers, kitchen knives, and wool socks. I signed up for the Amazon rewards card at your suggestion. I love that it doesn’t have a minimum spend for rewards! We also ditched the stores for Amazon for our holiday shopping. Shipping can minimal or free and it comes to your door, saving time and money! We love it. It’s hard to believe we actually used to brave the holiday crowds. Yikes! I’m very intrigued by Roku; I hadn’t heard of that before. I usually watch free stuff on Hulu, but they’ve been limiting their free content more and more recently. I didn’t know Nicholas Kristof did that. What a cool list! Thanks for posting. Neat list! Thank you for sharing that! Sarah , I have a difficult time finding a hostess gift to take for Thanksgiving, but your link lead me to the NYT article and then to Heifer International. I’m giving the gift of a flock of ducks to a needy family in my hosts’ names. The price ($20) is about what I’ve spent for speciality foods or wine in the past but I feel so much better about the gift and I know my hosts will love it. Thanks for the suggestion! That’s great, Donna! I’m so happy that the link was helpful. 🙂 A flock of ducks for a needy family sounds like a fantastic gift. I love the gift card idea. We do this, as well. One of our wedding gift cards was used to purchase Mini Monster a new winter jacket. I also love the idea of keeping an Amazon wishlist current for ourselves. Nothings bums us out more than getting a gift that we didn’t want and won’t use. For the holidays, we also practice time as trade. My good friends and I will offer babysitting services so our friends can enjoy an evening on the town together. It’s a great “free” gift that everyone enjoys. 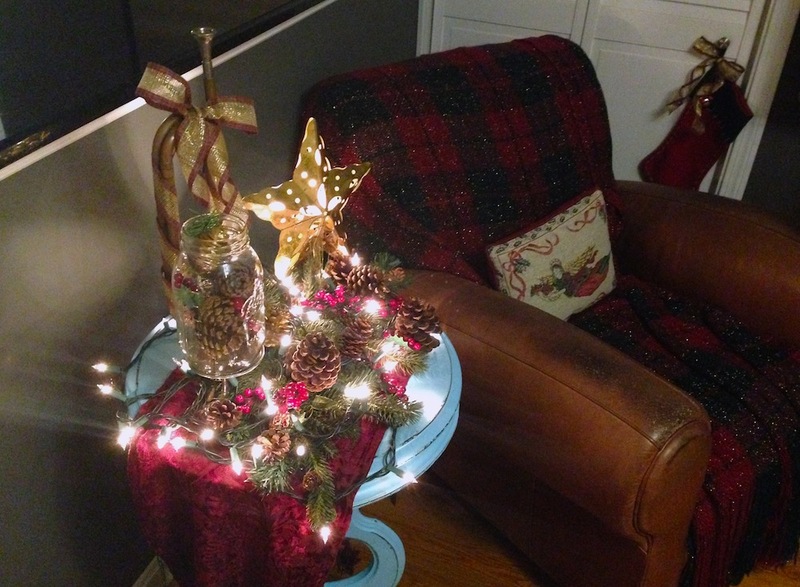 This post really makes me want to start decorating for Christmas! Trading time and services is a wonderful gift! In fact, it might be the very best. If our families were local, I think we’d probably employ that option a lot more. Practical gifts are wonderful. I also think it’s hard to eschew the notion of gifting in general. For years, I tried to dismiss my parents when they asked to buy us things, but that’s not really fair to someone. I always thought I was doing them a favor, but it turns out I wasn’t. I’m also a big fan of using Cardpool to buy discounted gift cards and use them for shopping. I can earn CC rewards when I purchase the gift cards, and the gift cards also go further. Love these ideas! Cheers to electric kettles. The best! My mom asked for gift ideas from me last night. I told her measuring cups (my kids took mine and now I can’t find them) and a 13 by 9 baking pan. Gifts aren’t very exciting around here these days! Several years ago, I decided Christmas gift giving was insane. There was a 5 foot radius of gifts around the tree. I decided that something had to be done. In January, I announced to my family that there were going to be Christmas changes at our house, they could continue to do what they want but my husband and I were only going to be giving out books, pajamas and socks. And we have stuck with it. I’ve always bought/procured gifts through the year and stored and labelled and gifted them at the holidays (a habit formed when were in college and very poor) So now I buy books, or funny socks, and pajamas in the winter months. And give them. There are special people for whom we give more but these tend to be homemade. Every year I write an operating room fairy tale for my mother, have it bound and give it to her. And to ourselves, we have been married 17 years. That’s a lot of gift giving and we, too, have wended down to the practical gift giving. The house usually receives a gift, along with the books, pajamas and socks. PS, this year my sisters and my mom are getting coloring books with colored pencils, my Dad a book about Jesuit heroes, my in laws books about Hawaii, my niece and nephew comic books. That sounds like a wonderful approach. I like that you came up with specific parameters that work for you and have stuck to them–nice! And, it’s great that you’re giving such meaningful gifts to your family members–I imagine they appreciate them so much more! We decided this year to give our Xmas to a young pediatric nurse fighting breast cancer and now the effects of chemo. We don’t need “stuff” and love the things around Xmas like a tree, movies, music, food and stockings. We will only spend $25 on stocking things for fun. One of my gifts will be a legacy box inventory (all accounts, passwords, etc and who to contact kept in a firebox. My husband and I do exchange gifts, but they’re always practical items. Last year, I gave my husband an alarm clock, wool socks, and waterproof gloves. He gave me a pair of workout pants and a workout top. I’m getting a new steam mop this year – woo hoo! I’m with you on glass food containers. My first Pyrex were actually a Christmas present from my husband a few years ago, and I’ve been replacing my old, plastic containers -which I never put in the dishwasher or microwave – with new glass ones. I still use plastic containers in the freezer, though. Do you use glass ones in the freezer? I use mine in the freezer all the time! Hey, don’t laught at the soap request, it’s on my Christmas list! As well as socks, hihi! I am a very “”practical”” person, and I never know what to ask for at Christmas (we have to give lists…). This year I can’t even remember what I asked for… (it’s been a couple weeks). Black socks and The Big Bang Theory, the only “leisury” thing on my list. What else… hmm…. a machine to make crepes. And… can’t remember! We have a small budget this year. 35$ for hubby (he, 35$ for me), 30$ per family members (5) and no budget for the kids but it’s not much since I found a lot of stuff for free or cheap, and couple of new things on special. I like to give gifts and I like to receive them, but I don’t like having a lot of stuff laying around so I prefer gift cards or activities as presents. And I have to say that I’m pretty good at finding deals, getting free stuff, etc, so people end up with a lot, without me having to spend a fortune. Woohoo! You’ve got frugal Christmas on lock :)! And, I totally agree with you, soap and socks are awesome gifts. Great article as always. Other great gift ideas: good sheets and towels, because who doesn’t love a great set of sheets or towels? My husbands family likes to give experience gifts as well, which we all love. This especially nice for the kids who hate getting too many practical gifts. A day out with an aunt or uncle doing something fun is a real treat for them and win-win for everyone. Ooo yes, good suggestions! Sheet and towels are always a great idea. And, experiences seem ideal as gifts–especially for kiddos. We love to gift experiences vs. stuff. Experiences also end up costing more than the typical gift item, but they are so much more enjoyable and memorable. Christmas is the only time when we really ‘splurge’ on big experience gifts and we set aside money for the occasion. Birthday celebrations are a bit more tame in our family. We too, have moved on to practical gift giving. In year’s past, we have cancelled Christmas in favor of buying one larger item for the household (like our first flat screen TV.) We don’t have a Roku, but do have an Amazon Fire Stick and love it. No recurring cable bill in this household. Anyway, back to Christmas…this year my wishlist includes a composting bin and a new griddle pan. My husband has asked for all weather floor mats for his vehicle. Pretty exciting stuff! We have obtained quite a few presents for our toddler, but many of them were free by redeeming points earned from Pampers, as well as bought throughout the year while on super clearance (like 75-90% off). He has new books, puzzles, musical instruments, a couple cars, an outside bowling set, and a board game. I love seeing the joy on his face while opening his new treasures! I like the idea of buying a larger item for the household in lieu of individual gifts. Mr. FW actually got a griddle pan for his birthday this year :)–it’s a great gift! I love Christmas but hate the awkwardness of the gift giving. We’re fortunate that family seem happy enough to receive a small envelope stuffed with cash. I never hear any complaints when they are greeted by ole Abe, Hamilton, or Jackson on a frosty Christmas morning. But we still receive the odd gift. I have no shame so I’ll give it away if it’s useless or sell it if it’s worth something. No reason to let it collect dust for 5 years and then toss it in the trash when it’s obsolete or out of style. I’m just glad Thanksgiving only involves overeating and football and we don’t have to worry about consumerism for a day. I am so with you on this — so often when I get a gift, it’s not something I actually want or can use. I’m torn because I so much appreciate the intention of the gift-giver, and of course I’m going to respond just as you described…but I always feel uncomfortable and a little guilty. And yes — Thanksgiving rules! No gift-giving required! Last Christmas we made pepperemint candy bath bombs for the ladies and popcorn balls for the gents in our lives. It was a hit and we spent less than $50 on gifts for our entire families. What kind of food processor do you have? Mine recently bit the dust and I’m in the market to find another one. Thank you! We have an older model KitchenAid, which sadly they don’t seem to make anymore… it’s a super straightforward model with just “on” “off” and “pulse” buttons. Hope you can find one that works! Yes to kitchen knives – those are on my wishlist. Socks and underwear are always good too! Heck yes to socks and undies! When I was a college student, I asked my parents to give me “care packages” for Christmas. My mom purchased a huge wicker basket and filled it with items like soap, shampoo, dishwashing liquid, bathroom cleaner, toothpaste, sponges, cleaning cloths, and my favorite skin products. The baskets rank as some of my all time favorite gifts and frankly, at a time when I did not have much money, they made my life better. That sounds fabulous to me! Such a nice thing to give people stuff they can actually use. when people are in the mood for giving, I’m into practical gifts or edible gifts. for my birthday this past year, I asked my husband and my immediate family (who still like to do b-day gifts because I am spoiled) to help contributed to a vacuum cleaner. We needed a new one (moved to a house with all carpeting) so we could get a better vacuum cleaner with the help of their Amazon gift cards. I know that’s a bad joke, about a wife getting upset her husband got her a vacuum cleaner for her birthday, but I guess I’m different because I love good cleaning supplies that make our lives easier! This year, husband and I need to buy a new washer and dryer so any holiday money (plus his birthday) we might have spent on presents is going to that. Also, we stopped exchanging gifts for Christmas except to immediate family last year and kept them small (like from my in-laws, we often get local central PA fare, like locally made ring bologna and/or Lebanon bologna (we’re really into cured meats, lol)). But we let them know that because we have a baby on the horizon, the only things we ask for (if they plan on spending money) are baby necessities (not clothing) or gift certificates to baby related stores. After moving recently, I have noticed that we have too much stuff and we don’t need anything else! Plus, spending money on each other can get stressful so we try to keep it to a minimum at all times. Those sound like wonderfully practical gifts to me! I’ve both given and received a vacuum as a gift, so I’m right there with ya. And, you can’t go wrong with edibles. I decided years ago that at Christmas the best gifts to give or receive are things that by their very nature will go away and not have to be taken care of long term. Food items, bird seed and suet cakes, postage stamps, favorite lotion, etc. My very favorite is my brother in law’s peanut butter fudge! Many thanks! It’s definitely all about balance for us. Love these ideas. We’ve mostly called a gift-giving truce in my family. For the few gifts I purchase, I try to get consumables (things we would probably buy anyway, like wine, beer, coffee, tea) and experiences we can share. I laughed out loud at your Corelle story. We dropped and shattered one on the edge of our patio a couple years ago, and it sounded like a bomb went off! Then there were tiny shards of it in the lawn forever. But aside from that, they’re great! Oh yeah–breaking Corelle is seriously intense :)! You’re missing something amazing! Just wait until Babywoods is born and you’ll realize that you have everything you need for a heartfelt gift for grandparents. Paint her hand, add a cute phrase, and you’ve got a tear-jerker of a Christmas gift! We just spent this weekend finishing up books for our parents comparing our baby pictures with our children’s. They turned out awesome, were extremely cheap, and we had a great time seeing who looks the most like whom. Oh fabulous! Thank you for figuring out my Christmas gifts for me this year (hope my parents aren’t reading this… ). This year I couldn’t think of anything so I just said to count our trip to Hawaii in June as Christmas and I thought my wife would say that doesn’t count and that I need to pick at least one thing out, but instead she said, “awesome, done!” I really just hate spending money on something just to get something….but your suggestion of tools above is really good. I do that a lot if my dad or father-in-law don’t have something I can borrow. One of the best holiday lists I have seen, nice job! This year because I’m paying off some debt, my husband & I aren’t exchanging gifts or stocking stuffers and I am able to use some credit card points to give gift cards to some family members, so I’m super happy about that. I’m also giving baking to a few close friends for the first time, so that should help cut down on expenses as well. I do give my daughter an expensive gift every year, but that will be the only pricey one under the tree. We will enjoy a lot of good food & wine during the holidays, so I’m expecting festive times despite cutting back on gift giving. It feels good to simplify. Want your holidays wrapped in more meaning — and less stuff? The holidays, meant to be a time of peace, reflection, and celebration, too often exhaust rather than uplift us. If you sometimes feel trapped by the shopping, spending, and frenzied preparations, you aren’t alone. That’s awesome–thank you for sharing! The Center For The New American Dream does some really neat anti-consumerism stuff. Very cool. I love your idea of creating an Amazon wishlist throughout the year! We usually do a Dirty Santa gift exchange with our family and use our Christmas budget to spoil our kids! We also send locally roasted coffee to our family in another state. It works! Food Processor is one of the best gifts that we received. Got it last year and we’ve used it basically every week to make food items. It’s great money saving equipment for the long term! This year we did an exchange for all members of my immediate family (Parents, kids, significant others) all people I would normally be buying an individual gift for. We fill one person’s stocking, and buy a gift for one other person. It’s great for 3 reasons: 1) Cost savings 2) Everybody con contribute ideas and make sure that each person is getting something(s) they really want/need, and 3) Way less time spent on shopping and strategizing. It has definitely shifted the focus to the time spent together rather than the gifts. I wish I could implement your gift card system. Unfortunately when I get a gift card I can’t resist splurging on something I’ve been denying myself previously for the sake of frugality. Baby steps I guess! I very much like the gift exchange idea–totally makes sense and less stuff overall! My goal is to make as many Christmas gifts as possible. It helps that my new hobby is crochet, I’ve already started making a scarf for my mom with free yarn. Also, we made a bunch of crabapple jelly in September that will be gifted to family members. – Donorschoose.org, which lets the donor choose a classroom project to support. A few years ago, my employer gave all of its US-based employees Donors Choose gift cards for $25 each, and then each employee could choose which project to support. Also, if you time your choice well, donors can sometimes find projects that are eligible for matching gifts, so the $25 Donors Choose gift card that you give to your mother could turn into a $50 gift for the project. – Giving non-profits items from their own Amazon (or other) wishlists. Generally, I think the most useful thing you can give a charity is cash (so they can figure out how best to use it), but in holiday season (especially when I’m giving gifts for kids), I prefer to give something that is more specific. So for example, this year, we have given Catskill Animal Sanctuary (casanctuary.org) gingersnaps (for the pigs) molasses (to encourage horses to take their medicine) on behalf of our nieces and nephews and some duct tape and WD-40 on behalf of my frugal, homesteading brother-in-law. When I am short on time but want to give something handmade, I sometimes give a recipe combined with a key ingredient. I have a recipe for a Cajun, vegan chili, so I print the recipe on nice paper and give it with a small container of Cajun spices. I buy the spices in bulk and look for inexpensive containers. You can also package the spice mix in something flatter (usually a sachet bag inside a ziplock baggie) to make it possible to mail the gift easily. In terms of frugal gifts, there are always the gifts of time and expertise. Although I haven’t given this as a holiday gift per se, I have used my skills in photo book design to make photo books for friends (mainly keepsake books for pets who have passed away). Many of the frugal fans of your site are tech-savvy, so they could offer skills to family members (e.g., helping them set up a blog or, better yet, get their accounts linked up to something like Personal Capital with appropriate notifications etc). You can also trade lessons with people who know how to do things you want to do. For example, if your friend knows how to knit and you know how to finish furniture, your gifts to each other could be lessons. One final suggestion for frugal wrapping of gifts. Instead of using store-bought wrapping paper, buy some inexpensive fabric remnants (there often are bolt ends of Christmas prints) and then wrap your gifts in those, using a couple of pins and ribbons to hold things together. You more easily reuse the fabric year after year (compared to paper that crumples and has tape that has to be peeled off), so it’s more ecologically friendly, too. You can also buy scarves at thrift shops and wrap presents in those – the scarf become part of the gift. Wonderful ideas, JH, thank you for sharing these! I especially love the idea of giving the gifts of time and talent. Those are my favorite types of presents. 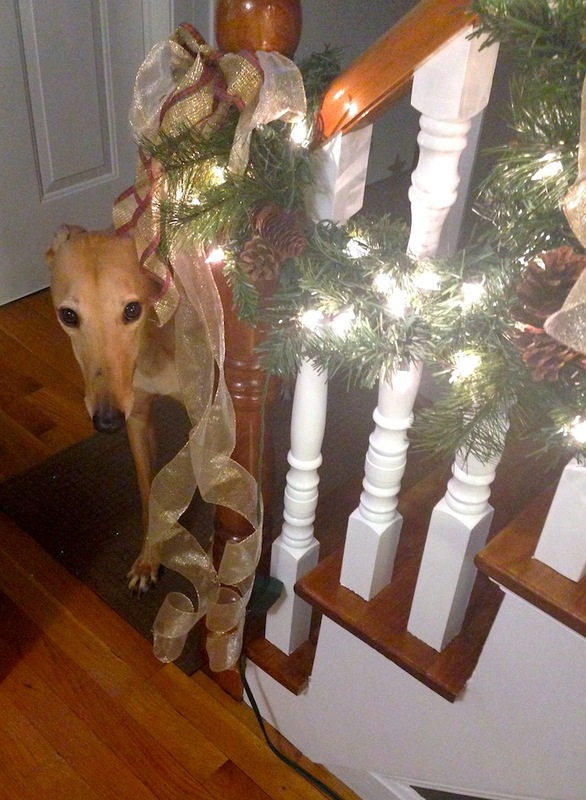 I like the wrapping idea too–that’s what my frugal sister does and I think it’s fabulous! I’ve actually been reusing the same wrapping paper for a few years now, but I imagine it’ll eventually give way and I’ll move to fabric as well. Ever since my husband and I started getting serious about our savings goals, we had a hard time justifying the required holiday spending that my family seemed to stress over year after year. Our “aha” moment came two years ago when I suggested to both our families that we do a simple gift exchange with used or home-made gifts only. The idea being that we all take inventory of the goods already stored in our lives and think about gifting them to each other. This made for a very special celebration. My dad gave me a tea pot that had belonged to my grandmother, I gave my mom her mother’s crock pot, favorite DVDs were gifted from my husband to his father, and my dad gave my husband some of his old favorite sci-fi books. In the end, the gift giving was so much more personal and meaningful, and no one spent a dime! Love it! Sounds like a perfect idea! That’s awesome! I wish you all the very best! I love that you and your family are all on the same page in terms of gifts. And your list of ideas is great. My family waffles around a bit… but often it is used, or consumable items… or experiences rather than things… My husband’s family isn’t quite on the same page… and though they do give thoughtful and nice gifts, and I am very grateful for the gifts, I often end up not using them… or not using them to the extent that I would wish… Last year we made sure everyone was aware that we didn’t need any “stuff” and were aiming for a minimalist Christmas. It sort of worked… I hope to do the same this year, and little by little we will convert them all. Haha! Ummm, my Amazon wish list actually has a kitchen sink on it right now. Though it’s got a note telling folks not to buy it since I put it on there mostly to remember the model and what characteristics I liked. We don’t really do much gifting, only really to my in laws who are big gift people. (My family is a-ok with me donating to charity in lieu of shipping stuff they don’t need across the country.) For me, the biggest joy is of getting a real tree and spending an evening together setting it up together. We don’t call it that, but it’s probably the best “present” Mr PoP can give me every year since I know he’s pretty indifferent to the whole practice and does it mostly for my sake. Oh that’s smart, Norm. We have a shopping list saved too, but sometimes it seems to get deleted so we should just make a private wish list. Also, Mrs. PoP, that’s hilarious. It sounds corny and old school, but I like to make mix CDs for people. I just use whatever is in my music library on my computer, and then make a list of the songs and artists. If I have time I write little notes about why I chose each song. Also, I love going to the movies (but hate paying for it) so I often ask for movie gift cards. Someone else mentioned food items, and this is a great way to support local businesses, too–same thing with soap. Local freshly made soap is an affordable luxury and most small soap-makers have nice packaging. Hand lotion made my local people is really nice too. I have some issues with Amazon, but their wish list is easy to use. I also use it to give ideas, rather than an exact item, and you can make notes about items, and you can add items from pretty much any website. For example, there is a beautiful handmade wooden tub caddy (basically just a shelf that goes across the top of the bathtub to hold things while you’re in the tub) and I know my dad could make me one, so I added it with a note saying that. That’s so cool you make mix CDs for people–I think that’s a really personal and fun gift! Nice! I usually give coffee, chocolate bars, books and/or gift certificates. A friend recently had a birthday and I gave her a chocolate bar and a gift certificate from Costco. I used to be the person who cooked dinner for everyone for Thanksgiving and Christmas but after last year, NO MORE! I made a huge pan (turkey baking size) of veggie lasagna plus several sides, bread, desert, wine etc.. I only had four people, including myself for dinner. I expected to eat off that lasagna for a few days after T-Day. Hurumph. Two gluttons(my SO’s brother and a friend) ate so much lasagna all by themselves that not only were there no leftovers. the SO and I never even got a second helping! Not only that but neither one of the bottomless pits brought a thing to share and nor did they offer to help clean up. That greediness brought out my inner Scrooge! BTWY: Neither one of these guts were a teenage boy or a football player or someone person who regularly eats one out of house and home. Both were people over 60 and one was female! I still have no idea how they packed so much in! that’s insane! I wouldn’t bother again either. I would guess neither of those two freeloaders have extended an invite back to you in the intervening year? Would I be right? So often that kind of person always shows up, grinning, contributes little-if-anything and then never reciprocates. I’ve had to really think hard and make a firm decision to stop always being the suggestion-and-organiser. Everyone always seems to enjoy whatever gets organised… for them… all laid on, with little required bar the odd bottle of wine. Somehow there’s never a return invite… so no more. Only those where there is more reciprocity. Not that it is AT ALL about keeping detailed score, and we all lived differently and have our strengths, but greedy, bottomless pits are often selfish and unwilling to put in effort in any arena, not always, but that is often the case. I think I might be ranting! Nope, no invites. What is even odder is that both bottomless pits went to another dinner BEFORE they came to our place. One dinner was a huge community dinner free (complete turkey dinner) to anyone who showed up and the other was a party given by people we know. Turns out we were invited to that party, but brother bottomless pit never bothered to tell us! Both of these people are what debtors anonymous call habitual paupers: people who could, if they wished, through work and frugality and minding their budgets, live in a more financially stable and prosperous way but instead choose a lifestyle that inclines them to habitual pauperism. (EG: refusing to keep any sort of a schedule, being habitually late, refusing to get any sort of training or upgrade of their skill set (or lack thereof) refusing to clean up and dress decently, etc..) If I want to feed the hungry, in the future, I will donate to the Food Bank or a soup kitchen. These people are off my list. Oh I’ve met those types before. Perpetually crying poverty but either A/ unwilling to do anything meaningful or effort-laden to address it OR simply mean and sponging by nature. Often a combination, with a shameless, entitled attitude. I’d have to be seriously in financial trouble to take advantage of a free dinner aimed at those who have little, either that or contribute something in return, but in life there are takers, and unfortunately there are usually kind people who pander to them, so they get away with it. We live and we learn I suppose… I have actually been at a Christmas day ”drop in and snack” thing where our wonderful, incredibly generous (and financially strapped as it happens) host made the most beautiful sausage rolls and other platters (we brought a couple of plates and drink, just in case anyone was wondering!) and another ”friend” arrived, bringing their entire extended family, about 8 people, none of whom particularly knew the host family beyond very barely having met, and ate like LOCUSTS, contributed zero. Then… and this still makes me all sweaty with shame… at the end, the wife said ”oooh… there’s so much left over, you don’t mind if we take some for later??”. I was very young at the time and said nothing, not my place, and our hostess just obliged them by handing them big Tupperware. Too kind for her own good, and charitable. I have never forgotten the blatant sponging and bare-faced nerve… awful people. Why buy soap when you can MAKE soap? That’s actually what we’re making for everyone this year. We always make something for all of the humans (pickles, vanilla, snack mix, candles, apple butter) and this year it’s soap, because like you say, it’ll get used! We also buy things for the closest humans, and send cards to those we won’t be seeing for the holidays. We encourage relatives to get us food gifts, because that will also get used. There’s nothing worse than gifts that just sit around until you throw them out (because they’re not worth bringing to Goodwill) and make you feel bad. I agree! “There’s nothing worse than gifts that just sit around until you throw them out (or pack them up for donation) and make you feel bad.” Spot on. I don’t need gifts that come with a free guilt trip!! Hubby and I’ve decided early on in our dating years that we shall skip all gift-giving to each other except our individual birthdays since they are uniquely our own and not major holidays. Giving one gift per year simplifies our life as neither of us really “need” anything and this decision allows that single birthday gift to really shine and feel special. We no longer waste time racking our brains divining what each other want for this or that occasion throughout the year. We prefer to spend time doing and experiencing something together during the holidays and our anniversaries than receiving an object out of obligations (which is why our birthday gifts lean toward experiential oftentimes). That said, I also practice your Amazon wishlist idea and find it immensely useful for myself in tracking my desires throughout the year. I’m also a proponent in regifting and gifting used items, so long one does it tactfully and has a solid grasp of the gift recipients’ stand on these two “gifting controversies”. I applaud you for employing them! As a frugal, environmental minimalist *what a mouthful! *, I strive to make good financial, environmental and healthful everyday decisions that are aligned with my values and principals. Not easy, but I try. I must say, many of the best things in life are free and abundant, if you care to look for them and truly appreciate their existence. Some examples are time to observe nature, afternoon naps, homemade bread, reading a thrilling library book, connecting with faraway friends and family over internet, receiving stellar services in public places (it warms my heart whenever this happens), gawking at cute doggies in my city, reading my favorite blogs (yay to the Frugalwoods updates!) and many more. 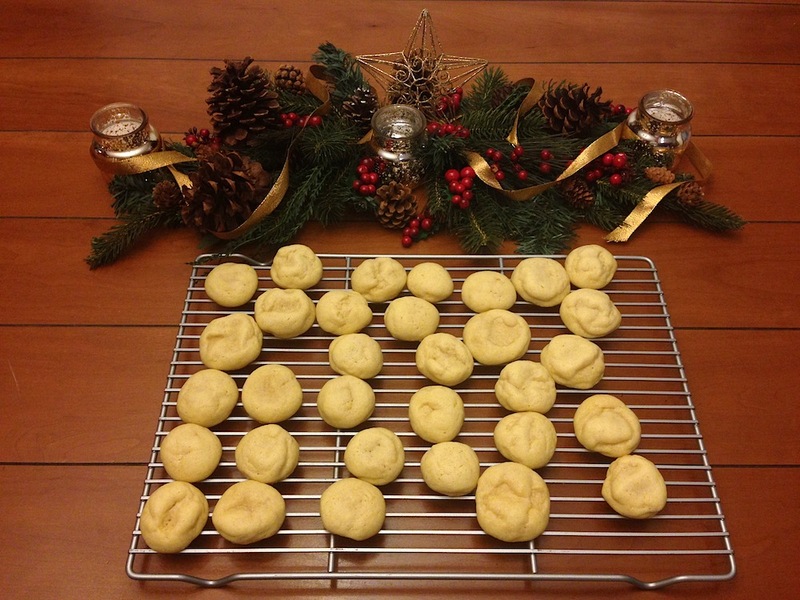 Now, can you please share your recipe for those buttery shortbread cookies??? Do they stay crunchy after a day? Loved this post. Your zeal for Christmas has brought some festiveness to my day, Mrs. FW! Love your approach, Natalie! Sounds very in line with what we feel as well. And, you’re very right that so many of the very best things in life are absolutely free. The sugar cookies I make are actually very soft little cookies without crunch–I love soft cookies, I must confess! i just budget for this. My parents usually make Christmas lists and I buy something from the list. I rarely buy toys per se for the younger generation–I often go with art supplies or reusable things like Legos. I’m with you on regifting! When I was a classroom teacher, I got all kinds of regiftables, like a holiday cheese plate that came with a knife whose handle was a Christmas light. Really. I regifted to an aunt of mine who loves entertaining, and she seemed to enjoy it. The same aunt once gave my husband a pair of slippers (as part of a popcorn gift basket) that were 4 full sizes too small and I suspect had originally been gifted to my uncle! Anyway, my father tried them on when we got home. They not only fit, they matched his new bathrobe, and I believe he wore them continuously for the remainder of our visit. Haha, gotta love the re-gifting! Brand name drop on your food processor? My last one was a dud and I’ve been wary of trying again. 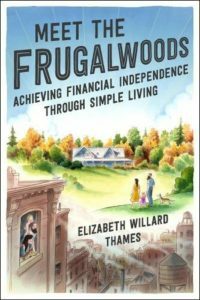 Hi Frugalwoods, I like giving personal development books to my friends to help them start the year with positive outlook or perspective because I myself would like to receive books from friends. And, this is something of value, right? Since having kids, it’s nice because we’ve agreed with our siblings to only buy for each other’s kids and not one another as well. None of us adults need anything and so it’s more fun to then have a little more budget to spend on the kids. And budget is a big thing I’ve struggled with for Christmas but have had to settle on. I feel guilty when others spend more on us than we are able to reciprocate but I think I’ve just had to get past it. I decide on a dollar amount for each person (usually $20-$25 each for about six people and four kids) and then just have to stop myself once that’s hit. I don’t know why I have such guilt over it – I think it’s because even though our family tries to understand or frugality and minimalistic living, they don’t live the same way so it isn’t as natural. Love these ideas! One thought about saving money on good tools is instead of purchasing a tool for a one time need, borrow one from a neighbor or friend. Our neighborhood is a pretty tight nit community, and we use Nextdoor.com to stay connected. When we need a good tool we know we will only use a handful of times at most, we just ask if anyone has one we can borrow! Last year I gave the toddler next door to me an empty ketchup dispenser bottle (the kind that squirts). It was his best gift. His mother took it right in stride because it made her kid happy. I think this year I’ll give him a spatula! Almost every single gift I have ever received in my life I ended up giving away. For years I stored them all, but now I don’t. My family is against practical gifts, and buy nothing but stuff. Nothing useful, nothing I want. I’ve always felt bad, because so many of them are really poor, but I feel better knowing that at least someone is using their gift, so it wasn’t a total waste of money. My two teenage daughters each get 4 gifts picked from their wish list in the categories: want, need, wear, read. They get a kick out of picking a couple things that fit each category and then I choose from them. For my extended family, we always do a Yankee Swap with a theme each year. Last year’s was food. It was a lot of fun and everybody got something they wanted. Love the idea of a Yankee Swap–hilarious and frugal! We do a Yankee Swap at work. Last year I suggest the theme “Made in USA”. It was interesting to see the gifts that appeared. And it was interesting to see while shopping just how many items are not made in the USA; I knew this to be true, but it really cast a light on the subject for some (and some gave up and bought a gift made in a country other than USA). I gifted a 3′ x 5′ US flag, made in the USA — it was the most sought after and swapped gift and, while shopping, it was surprising to see how many of our flags are made in China. The other good point about this restriction “Made in the USA” means that one could make a gift rather than buy one and hopefully the materials used to make the gift were made in the USA! Since you mentioned Mr. Frugalwood’s famous homemade hummus recipe, any chance you could share it with the readers at some point? I know you’ve mentioned that he doesn’t exactly follow recipes, but I remember you posting one time that he makes it without tahini (the most expensive part!) and I’d love to be able to frugalize the hummus we eat in my house. 1) Open and drain a can of garbanzo beans. 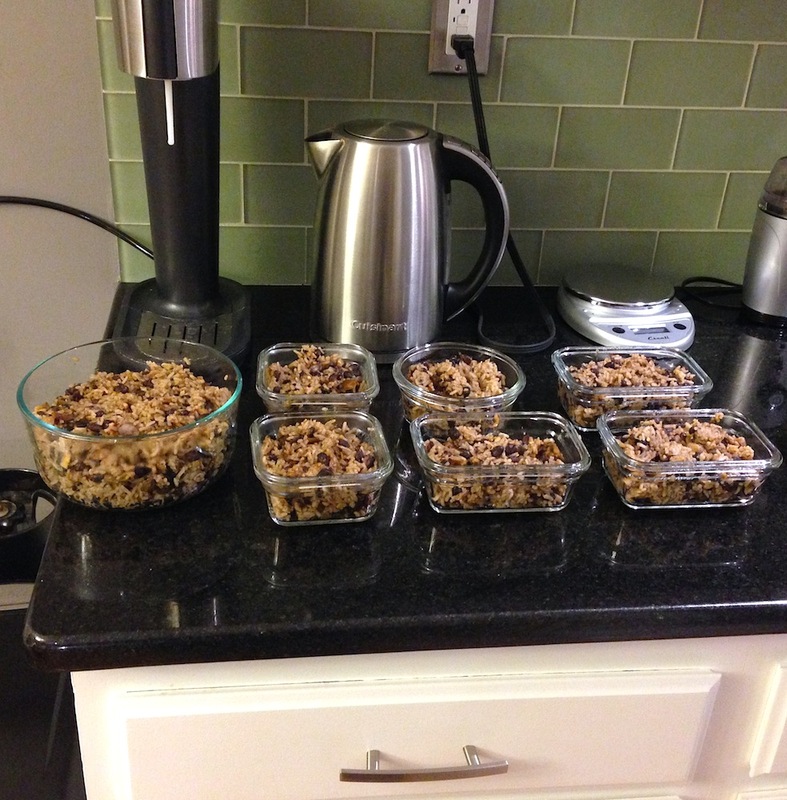 2) Put desired amount of garbanzo beans into food processor. 3) Chop up 3 cloves of garlic and add to the food processor. You can just do a rough chop since the food processor will do most of the chopping for you. 4) Add 4 heaping spoonfuls of Chinese chili paste to the food processor. 5) Add salt to the food processor. 6) Turn on the food processor. 7) Add a small amount of water as you start the blending process. 8) Pour in olive oil as it blends. 9) Periodically stop the blender and stir to ensure there are no clumps. 10) Process it to the consistency you like. Hope you enjoy it :)! Don’t forget to checkout at Amazon with Amazon Smile. It gives 0.5% to a charity you’d like to support. I am supporting Christian Student Foundation in Morgantown West Virginia at West Virginia University where they do a lot of outreach in the community, and in a university setting that is in the top 10 for “party” schools, they need all the help they can get! We do the same thing with our amazon lists. Makes everything so much easier! Small business Saturday is coming up. It’s hard to shop out in the community when online realtors are cheaper, but I like to keep in mind that shopping locally benefits the community. We are all about giving practical gifts to each other if we give anything at all. Sometimes it’s olive oil or nice salt. I love the idea of giving a Roku because we LOVE our Roku! The first few years my husband and I were married we had no $. That didn’t stop us from making gifts. I made candles with leftover wax that I put in free baby jars that I decorated. Another year I made monogrammed cards with card stock I already had and a nice letter stamp set. An additional idea is the cookie mixes in a jar. Gather canning jars all year, buy the food supplies on sale and you have a great useful gift! For my brother I was able to do a gift basket with soaps, shavers, toothpaste etc all from items that were free with coupon or rebate! I’ve tried saving my gift cards from Target but end up using them to “roll” into another gift card deal. I love the idea of using fabric to wrap gifts, I just have so many gift bags, they get reused every year! We have this one cute bear box that we have used for at least 30 years. Lol! Looking forward to Christmas! Nice! I am the least crafty person on earth, but I wish I could make cool homemade stuff like that! I found myself nodding in agreement throughout this whole post. I do about 90% of my shopping on Amazon. Electric tea kettles and food processors are my two favorite kitchen instruments, and Corelle plates are magical, especially with two young kids, the youngest of which has a penchant for throwing his plate when he’s done with it. I love how practical you are with your gift list! I like to do similarly and request Amazon lists from family too. It’s so much nicer to know I’m buying something that will be used. P.S. I’ve had one of those kettles for 4-5 years now and it’s the best! Love the list! And I’ve been wanting a good kitchen knife. Any recommendations on a reasonably priced, dishwasher-safe, chef knife? I wanted to gets chef’s knife ! You know, the kind Rachel Ray and the other chefs use to rapidly chop veggies! But, frugal me, what if I did not like it, or never used it. But one day at a thrift store there was a Farberware one for $1, in as perfect condition as a new one. I don’t know if Farberware is considered a good quality knife, but it is a heavy chef’s knife and when I held it, it had a good, substantial feel in my hand. So I purchased the knife. From the first use I liked using it. It really IS easy to chop with these knives! I do not think I will be replacing my bargain knife – it does what I hoped and expected it to do. Wow, we ARE kindred spirits. I’m so happy, especially at this beginning-of-holiday-stress-time, to find someone else who thinks as we do! “We abhor waste and cringe when money is wasted on things we don’t need” is right on point. Especially because I am the one saddled with keeping it all organized and cleaned up. We sort of got our parents to scale down in their gifts for the kids (we set a limit on # of gifts) but they just don’t get it. Even though I tell my mother I really don’t need or want anything, (and in reality her gifts usually end up being donated or, gulp, sold), she insists that she has to get us something. However, even when I give her VERY specific instructions, she still gets the wrong thing, or something else. Then gives me the receipt. And a guilt trip. And now I have to do the work of returning something I didn’t want in the first place. Ugh. My MIL gets us season passes for a local amusement park, which we ask for, but she insists that these small envelopes aren’t enough and gets us something else, too. Usually something I neither want nor need. I love the Amazon wish list idea. And we are totally in favor of thrift store gifts, as long as they are in good condition. After all, it’s new to you, right? Why should we use up resources to make a new whatever, when there are already perfectly good ones around? Many people will say you should be grateful that someone is thinking of you and wants to give you a gift. But I disagree. It’s really hard to grit your teeth and be grateful for something you’ve been given when you specifically asked to not be given anything, and now you have to find someplace to put it or make an extra trip to return/exchange/regift it. I have just discovered this website and am thrilled to discover, via the comments, all these other frugal people! The comment about wasting money causes pain – oh so true! We are thrift store shoppers. And since I love to bake, my Christmas gifts to anyone other than my immediate family are baked goods. And half of immediate family’s are baked goods. Always enjoyed, and no need to find a place for it or return it to the store! I’m so glad you found us :)! 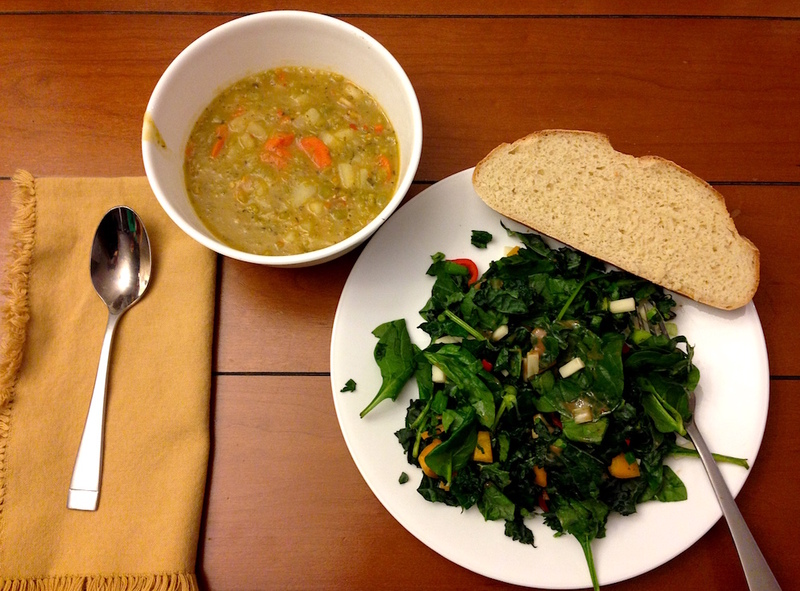 We do have a wonderful community of frugal folks here–so happy you’ve joined us! I agree with you on baked goods, they’re always a welcome gift. I just discovered your blog and it is just fantastic. I know I’m late to this post but it just resounded so strongly with me. I was just talking to my coworkers yesterday and they were all stressing about all the things their kids were demanding for Christmas (a 9 year old is getting an iPhone!) and how they weren’t sure if they could afford it or not. When they looked to me for a similar story, I just shrugged and said, “All done. Not worried. The kiddo [he’s 3] always gets three things: something to read, something to wear, and something to entertain himself with.” Their mouths hanging open in shock was comical, to say the least. Of course, I’m the sole frugal weirdo at work so they immediately launched into a tirade of how I’m “depriving the poor baby!” I just laughed. Lovin’ this blog so far. Congrats on your own little one! Looking forward to seeing y’all return. That’s awesome, Noa! Way to rock it frugal weirdo style :). I definitely don’t think you’re “depriving” your baby–rather, you’re raising him to be grateful and not greedy. Nicely done! 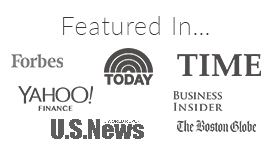 Thanks so much for reading and sharing! -It allows you to take time to appreciate each gift. I think this is especially important for children as opening a whole pile of presents is really overwhelming for them. -While everyone else has post-Christmas blues, you are still quietly enjoying the holiday. -It feels very extravagant without necessarily being so. We do similar things that the FWs and other commenters do such as give consumables (that reminds me that I have to go get Mr. Cheapheart his beloved corn nuts) and necessities. We usually make a wish list for each other and honor some of the wishes as well as include some surprises. Last year I gave Mr. Cheapheart the gift of taking a pizza making class together at the King Arthur Flour Education Center in Vermont. We got to spend the day learning how to up our homemade pizza game, and while it was not cheap, it has probably paid for itself with all of the yummy pizza we have eaten at home. For very sharp low-cost knives that never need sharpening, buy ceramic knives. Bad for prying, but great for slicing. On the Glass food storage-I bought the Rubbermaid Premier set (and then got another as one of those practical Amazon Wishlist Christmas Gift Items). Stain free and guaranteed by Rubbermaid never to break. They are stack-able and really the only downside is that they aren’t oven safe but they are drop safe!